It can be a tough process, picking a band name. Maybe a cool word or phrase pops into your head. You Google it, it's taken. Maybe you tweak it or change the spelling. Maybe you just start over. Or maybe you just use it anyway, hoping that no one will be the wiser... or file a lawsuit. 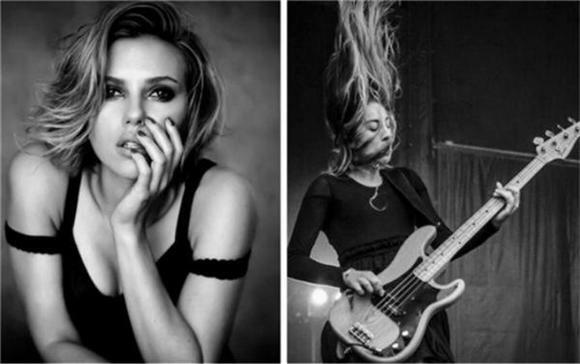 Such is the story of the new supergroup The Singles, fronted by Scarlett Johansson and Este Haim, Holly Miranda, Kendra Morris and Julia Haltigan. Last week they released their first single, the shimmery pop song "Candy," and this week they received a cease-and-desist letter from the other band named The Singles, also from Los Angeles. How rude! It's ironic that they chose that particular band name to copy—get it? Singles, but there's really doubles? Get it!?. This mistake has been made before. The UK group One Direction took the title of an American boy band, who after some back and forth lawsuits changed their moniker to Uncharted Shores, um... who?. The Verve added "the" to their name after pressure from the jazz label Verve left them no choice. Pearl Jam wanted to call themselves Mookie Blaylock after a basketball player, but the athlete's name wasn't shareable since it was considered a brand (THANK GOD). But was all this necessary? What would the world be like with two One Directions? And does it really matter if bands have the same name, anyway? There's a lot of reasons why musicians shouldn't take a name that's already in use: fans will get confused, and domain names and twitter handles will already be taken. It's also disrespectful, and lazy. Any aspiring artist can tell you how hard they've worked to promote themselves and get their music- via their name- in the spotlight. There's also no excuse for it, since there's this thing called the Internet. Scarlett Johansson couldn't, at the very least, have looked up her supergroup's potential name and realized the first search result is another band? It could have just been an honest mistake, but it needs to be corrected. So what's a band to do, besides picking a name so strange no one has claimed it? Maybe Scarlett could call her project The Syngles, since The One And Only's, The Ones and The Originals are taken.